Saturday, March 9th: 9:00 AM to 5:00 PM – Retreat, Dharma Talks, & Interviews. Sunday, March 10th: 9:00 AM – Morning sitting with a circle talk. We may also have a precepts ceremony (if enough interest) or a memorial ceremony, details TBA. 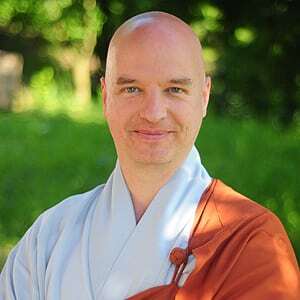 Chong An Sunim started Zen practice in 1990, in his birth place Budapest, Hungary. He became a monk in 1994, and spent the next six years training under the guidance of Zen Master Seung Sahn at the Seoul International Zen Center, Hwa Gye Sa, Korea. He was given the title ‘Dharma Master’ and thus became authorized to teach in August, 1999, by his teacher, the late Zen Master Seung Sahn. Chong An Sunim continues to serve as founder and abbot of Won Kwang Sa and immerses himself in practicing and teaching Zen. He received full Dharma Transmission on May 9th, 2017 from Seol Jong Sunim, thus becoming the first Zen Master of western origin in the Jogye Order of Korean Buddhism.